In October 2018, Massachusetts passed a law requiring early screening for dyslexia. This legislation acknowledges that dyslexia is a neurological condition, establishes a process for early screening, and requires implementation of research-based methods to help children with dyslexia learn. Maggie worked hard to pass the law by making posters and asking friends and family to call their senators and house representatives. It is sure progress that the law recognizes dyslexia as an important issue, but Massachusetts faces a large task to figure out how to implement this law. 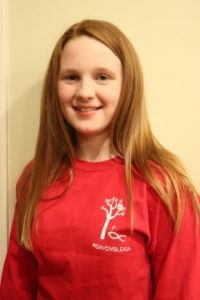 To that end, Maggie designed a t-shirt both to raise awareness and to support her teachers as they implement the new law. The Einstein quote on the back says, “Everyone is a genius. 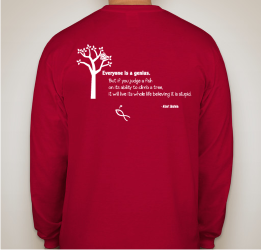 But if you judge a fish on its ability to climb a tree, it will live its whole life believing it is stupid.” Maggie sold the shirts during the month of October, both to raise money for the Arlington Education Foundation, and to remind everyone that dyslexia isn’t a disability! Maggie’s sale raised $760 for AEF while bringing awareness to the Arlington community about dyslexia.